Did you know that the quality of a mattress decreases significantly after 10 years of use? Some mattresses that aren’t regularly rotated and cared for only last about five years. If you’re like most Americans, you’re probably sleeping on a mattress that’s over five-years-old. But, when is the right time to replace your mattress? Whether it’s an aching back or hurting hip, your body communicates to you when something is wrong. If you’re constantly waking up with aches and pains, your body is asking for a new mattress! The right mattress will leave you waking up with a body that feels great. If your mattress begins to sag or you’re constantly rolling to the middle involuntarily, your mattress is probably uneven. This happens over time and with constant use, but it’s still a sign that your mattress needs to be replaced. Your new mattress should have no sagging areas or dents. A person’s brain and body need roughly seven to eight hours of uninterrupted sleep every night. During our sleep cycles, the body and brain are recharging and processing the previous day’s events. If you are constantly tossing and turning because of an uncomfortable mattress, you are not getting much-needed sleep that is crucial to ensure good health. 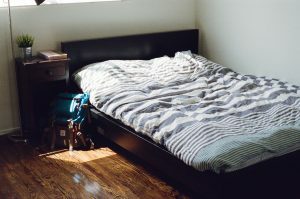 Is it time to replace your mattress and get rid of unnecessary clutter? If so, contact the Mr. Junk team today!